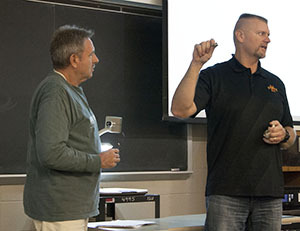 Adam Timmerman, former NFL offensive lineman, traveled to Iowa State on a recent snowy Monday to share his experiences with Ron Deiter’s Economics of Sports class. The Cherokee, Iowa, native spoke about his 12-year professional football career, during which he played in 172 out of his teams’ 187 games. Timmerman played football in high school and college, graduating with an agribusiness degree from South Dakota State University. In 1995 the Green Bay Packers drafted him in the seventh round, and he went on to play in Super Bowls XXXI and XXXII during his four seasons with them. His love of the Midwest guided his career. He signed with the St. Louis Rams in 1999, despite getting another offer from the Philadelphia Eagles. He played for the Rams for eight seasons, which included two more Super Bowl appearances. He became the first player in NFL history to both win and lose a Super Bowl with two different teams during his career. Timmerman spoke on his experiences in the NFL, including draft slots, free agency, working with agents, NFL collective bargaining, health insurance, retirement benefits and signing bonuses. He also shared his thoughts on NCAA recruiting policies and rules. Citing the sizable revenues generated by college sports teams, he argues in favor of compensation of college players. Despite several surgeries (“That’s what the off-season is for,” he quips. ), he never missed a game due to injuries until his final year with the Rams. During a screen pass, teammate Steven Jackson hit him in the back with his helmet, breaking several of Timmerman’s ribs. Several years after he retired, the Rams moved from St. Louis to Los Angeles in 2015. After retiring from the Rams in 2007, he, wife Jana and their three children returned to Cherokee, where he farms with his brother and nephews. He and former quarterback Kurt Warner are active in the Fellowship of Christian Athletes. 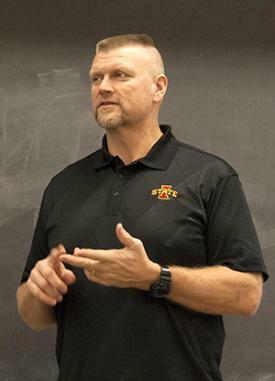 The Timmermans’ son Mason is now a freshman in software engineering at Iowa State.